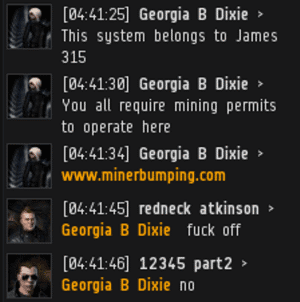 Previously, on MinerBumping... Just when the Mission Ready Mining corp thought peace had returned to Gelhan, Agent Kalorned's bumping and ganking campaign was followed by the appearance of Georgia B Dixie. Georgia was a Machariel pilot, and she found joy and purpose in bumping the non-compliant miners of Gelhan. It soon became clear to the MRM miners that Georgia had learned a lot from her mentor Kalorned. She was able to quote the Code from memory and bump the Gelhan ice anomaly clean. For Mission Ready Mining, it was as if the Kalorned nightmare was repeating itself all over again. Were they really going to have to deal with another Agent of the New Order? In any carebear rebellion, the first step is to shout some jeers in local to see if the Code enforcer can be rattled. If the Agent proves to be unflappable--as is always the case when dealing with the New Order--additional steps need to be taken. Georgia's Machariel attracted counter-bumpers and other pilots who intended to interfere with her bumping operations. But no matter how many ships MRM sent, none were willing to even attempt to gank her. Georgia was energized and filled with wonder by the power the Code gave her over everyone else in the system. "This must be what it feels like to be Kalorned," she thought. Mission Ready Mining is a corporation with well over two thousand members. They weren't simply going to give up. They instinctively (though wrongly) believed that there must be some way to stop the New Order. 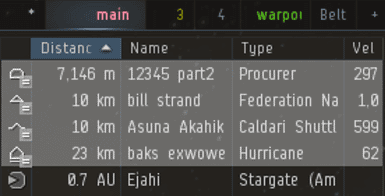 The rebels' next idea was to petition CCP to permaban Georgia. Our Agent laughed off the threat so easily that the plan was immediately discarded. On some level, the carebears understood that the source of Georgia's power was her faith in the Code. Now they sought to undermine that faith. 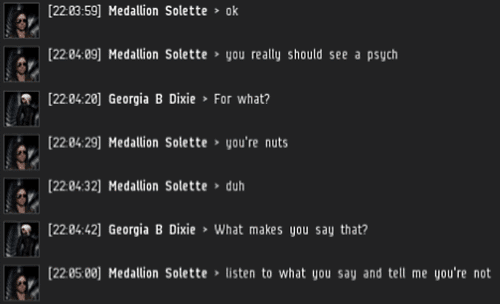 One after another, the miners presented arguments to try to get Georgia to doubt the Code and discredit the New Order. Unfortunately for the carebears, our Agents have heard it all before. And even if the Agent is new, it's easy to see through the miners' self-serving, hypocritical arguments. 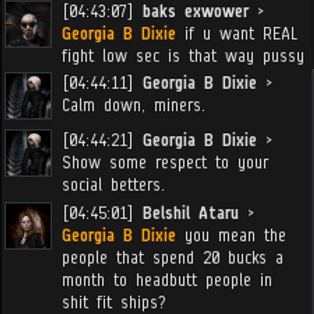 E.g., "I only mine in highsec and want total safety, but you're a coward if you don't go to lowsec." It's hard to overstate the power of the bumper. In fact, after witnessing a bumper in action, many carebears will encourage the bumper to switch to ganking. MRM and its allies became frustrated. No matter what they tried, they couldn't persuade Georgia to give up. If they were going to stop her from becoming another Kalorned, they'd need to resort to much more drastic measures. MRM has so many members but they can't pull together gank squad to kill one pilot? Shows they really are just scared sheep lol. Maybe because they don't want to gank, they would rather have an actual fight rather than suicide ganking like some suicide bomber Allah Akbar extremists. I'm sorry did I just describe your methods. Dumbfuck. I don't even play this game anymore I just come here while bored at work to collect the tears. But keep on defending those pathetic miners. He just blew himself up. Pieces over there, and some over their, and a few over there. Just a quick pop in to make sure your blog is following the rules. Yup you guys are staying moderated and nerfed like good little children. now play nice or we will have to pull out the harsh language again and make you all cry. 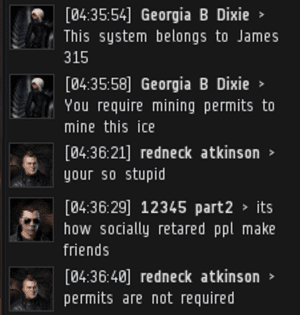 "I only mine in highsec and want total safety, but you're a coward if you don't go to lowsec." After all these years, carebears still don't get it, a predator always goes where the prey is, in our case hisec. The >1% guys still trying hard. Yall cute, did you know a war is kicking off? 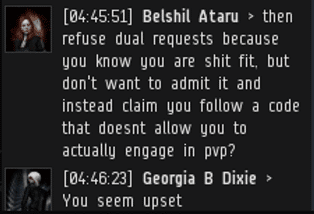 I'm sure your rushing off to go do some elite PVP, right, supporting your buddie who actually fight? No your not, your still playing ISIS. This is what I call a bumpy merry go round for one big happy dysfunctional ganking family. 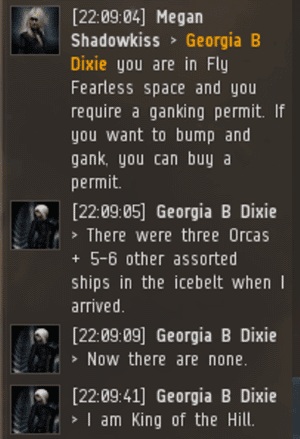 So did Jamey's slave Georgia B Dixie purchase a ganking permit from Megan Shadowkiss? Nah they cant follow rules. Of course not, these Nazis cant think for themselves.